Consumers who have decided to install hardwood floors in their homes must also decide what hardwood flooring contractors they will hire. In most cases the store they purchase the hardwood from can also provide installation services for them. They are providing a list of subcontractors that have been vetted by the store. Most hardwood stores will only recommend hardwood flooring contractors that they have experience with and who they can count on to do a good quality job and who also stand behind their work. After all their reputation is on the line as well, since if they have a dissatisfied customer, it will not matter whether it is with the material or the subcontractor, the store is still going to get a bad reputation. However everyone has to begin somewhere and this is also true of hardwood flooring contractors. They need to gain experience and sometimes will work under another professional hardwood flooring installer to learn the trade. They may work together until the contractor has sufficient experience that they feel they can go out on their own and take on their own contracts. The questions for consumers is whether you want to be part of the training period when you are probably spending thousands of dollars on a new hardwood floor. We put together several questions that will hopefully help consumers when they are hiring hardwood flooring contractors or even just going with the contractor that the store recommends. How Long have you been laying hardwood floors? How many installations have you completed on your own? Can you provide references that are willing to speak with us? Will you stay on our contract until it is finished? You may have other concerns or questions that you also want to ask the contractor that we have not listed. let us know what they are and we will add them to the list for other readers. Some home owners will request the contractor to explain how they will go about the installation, which way will the grain of the floor flow, how does the grain flow relative to the joists underneath and so on. 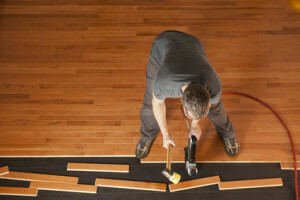 For example, your floor will gain maximum strength of the hardwood strips flow across the joists underneath the floor. this can be very important if you want to minimize squeaks in your floor. Most floors will squeak at some point and in one or two locations. In fact our floor squeaks in the winter time when the humidity in the house is the driest and the wood shrinks a bit because it is so dry. It also squeaks in the hallway and nowhere else for some reason that we have not been able to figure out and only in the winter time as we explained. This is one of the weird things about our home and it will be a different location and even a different time of the year for your home. Having the contractor explain how he will install your floor will tell you a lot. If he does not mention installing across the joists, then you may want to add some probing questions of your own to see if he really knows what he is doing. Another point is that I like the contractor to set up his saw outside to minimize the dust in the house. Feel free to leave comments for our readers about your own experiences and any suggestions that you may want to leave for our readers. 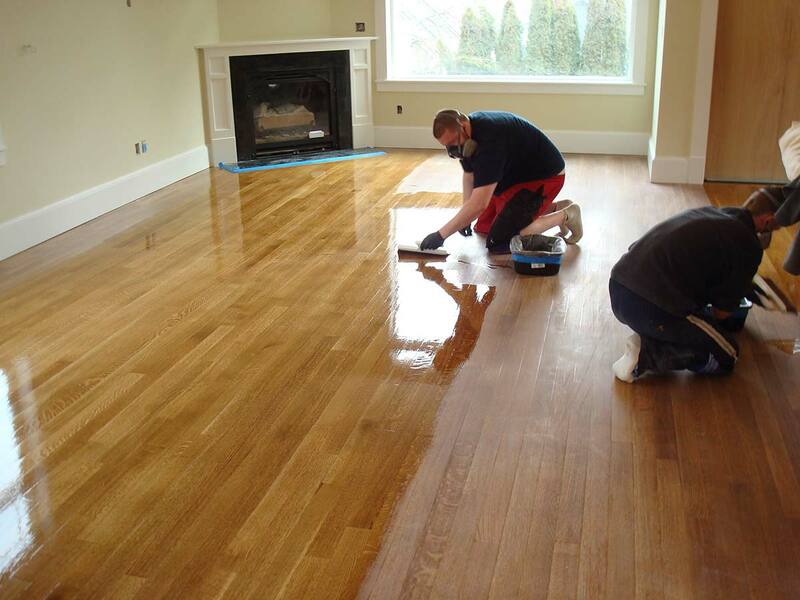 We can all assist each other to avoid situations that are less than what many people would like to experience with hardwood flooring contractors. How does the average consumer hire hardwood floor contractors or should they try to install the hardwood floor themselves? These are the types of questions that most consumers ask themselves when they are considering installing a new hardwood floor. If they are thinking about hiring a hardwood floor contractor, should they use the one recommended by the store they are purchasing the wood from? Or should the go and find one on their own? We will spend a few minutes discussing these issues. Hopefully our comments will help readers make up their minds regarding which approach to take. Most stores have a number of hardwood floor installers on contract that they can refer their customers to. Some of the installers will actually be employees if the store is large enough. However most will have several contractors that are known to them and have a reputation for doing excellent work. They will not refer work to contractors unless they do have an excellent reputation. Since any work that is not satisfactory will reflect badly on the store. This is just common sense and makes really good business sense to operate in this manner. Stores that hire the contractors for you will usually warranty the work these contractors do. If they refer contractors to you and you hire them, there is no warranty from the store for the work the contractor does. It also depends on who your contract for floor installation is with. Pay really close attention to this point. Just because you pay the store for the hardwood material and installation, you could actually be signing two contracts. One for the hardwood material and a second one for the installation. It is always a good idea to clarify this point. If you have an issue with the installation of the flooring, who do you turn to for resolution and warranty? Will the store stand behind their product and their services which includes installation? If the store wants you to sign a separate contract for installation, they may be just processing the contract. Also collecting a finder’s fee for passing along the work to the contractor. In a situation such as this one, the store is not taking any responsibility. Consumers should be more careful in this situation. You may want to ask for references before you proceed. The onus is on you the consumer. Hence you may as well hire someone who you are comfortable with after having done your research. At this point a basic decision regarding whether you should hire a contractor or do the work yourself is in order. If you are handy and take the appropriate courses or read blogs like this or watch the many Youtube videos on the subject, customers can save a lot of money. The money you save will pay for the tools you need to buy or rent and you will have the satisfaction of having done the work yourself. There are many good contractors around and they can be hired at a reasonable price. Check out the criteria for hiring contractors on our website. If you have the time and are not afraid of work and learning how to lay a hardwood floor, most consumers will give it a try. Most hardwood floor contractors, at least the good ones will provide references with no problems at all. They will also have pictures of some of their work that you may be able to take a look at. If you are not happy with the work discuss it with the contractor right away. Monitor the work during the day the floor is being laid and let him know right away before the floor is completed. It is a much bigger job to correct a defect after the floor is finished, rather than when it is in the process of being laid. Installing laminate flooring is something that you can easily do yourself. Why pay professionals to do it when the instructions for how to install it are printed right on the package. 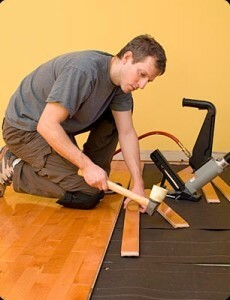 Also many flooring stores offer beginner courses to help the do it your self consumers. In addition, all the manufacturers of laminate flooring have the directions for installing the flooring available on their websites. These floor pieces are designed to click together and will float on the floor. There is no nailing required, which makes it suitable for direct placement on cement floors, although you may want some insulating value under the floor. There are some differences between installing laminate floors and installing hardwood floors, but you can use the same tools for both. Tools can be purchased although most people will rent them for the time they need them. The first step in installing laminate flooring is to calculate the size of the room and purchase the flooring of your choice. You should leave hardwood flooring open for a time so that it can become acclimatized to your home. This is not the case when installing laminate flooring. When reading the directions as to how to install laminate flooring, you will learn that you can install it as soon as you open the package. You should also check all the planks before you install them to ensure that none of them are defective. You will get a refund for any defective planks, as long as they are not damaged by you in any way. 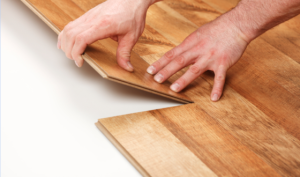 If you have difficulty getting the laminate planks to fit together, you should not put them together and take them apart more than three times. 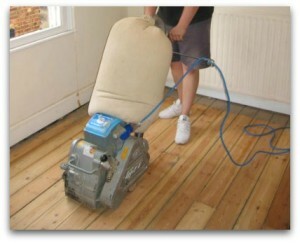 This could damage the laminate flooring and mar the effect when you have it completed. If you are installing laminate flooring in your kitchen, you should have the cabinets in place beforehand. This means that you will have to learn how to install laminate flooring around the cabinets. This is also why you need to have a saw to cut the planks when you need smaller sizes and pieces to fit around the cabinets. Most people will opt for a tiled floor in the kitchen and also in the laundry room, however some will go for wood floors because they like the look and feel of the wood better than the tiles. When installing laminate flooring in the laundry room, you should make sure that you have rubber pads underneath the washer and dryer. This is to make sure that these appliances are level so that they won’t damage your flooring. Although most people do not have laminate flooring in the laundry room, there is no reason why you can’t use this room of the house to learn how to install laminate flooring. You can even practice installing hardwood flooring on this small area before you tackle more visible rooms of the house. You might be in need of a few tips for installing laminate flooring if you are just learning how to install laminate flooring. If you have to place the laminate flooring around pipes, one tip is to drill a hole in the plank about ½ inch larger than the circumference of the pipe. Then cut the plank through the center of the hole and fit the two pieces of laminate flooring together around the pipe and glue them together. When installing laminate flooring, the flooring should extend under the door frame. If you have a piece of scrap that you have left over. You can use this as a marker for the depth that you need to trim the door frame. If you are not changing the height of the finished floor, most doors will continue to work just fine without scraping the floor. On the other hand if the floor is being raised for whatever reason, you may need to trim the bottom of the doors. 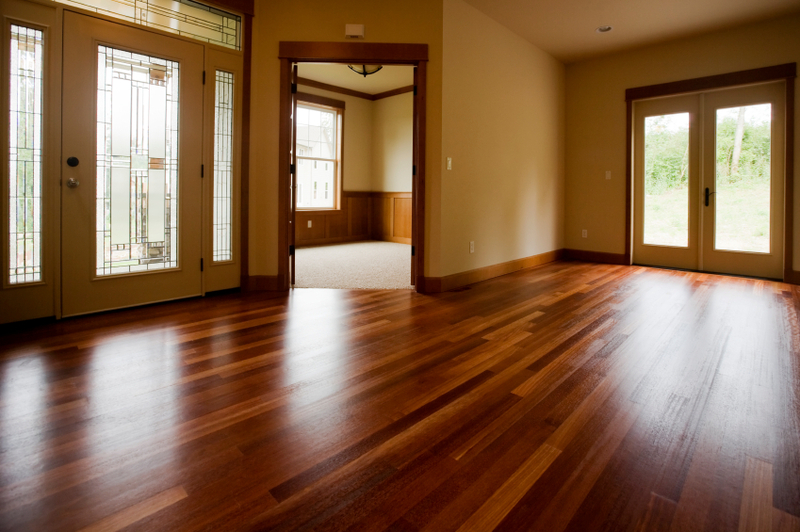 Installing hardwood floor is a great way to improve the look of any room. Installing hardwood floors will also increase the value of your home. 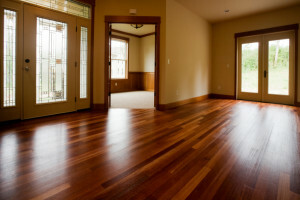 When it comes to selling your home many buyers are looking for hardwood these days instead of carpet. The natural look of hardwood is a beautiful addition to any home that can be enjoyed and cherished for many years, but installation of new flooring requires some work. With organization and planning along with some carpentry skill, you can succeed in installing hardwood floor and begin to enjoy everything hardwood flooring has to offer. If you are not skilled in this area, it is often best to hire a professional, take a course or get a friend who knows what they are doing to help you. Better to get help than make a mess of your new floor. You can save a great deal of money by doing it yourself, all we are recommending is that you invest in the proper training and purchase the right tools before you begin your work. This will pay off big time with a perfectly installed floor that you and your family can be proud of, will add a great deal of enjoyment and will increase the value of your home as well. Before you begin to lay down the new floor boards it is important to store them indoors for a few days to expand or contract and adjust to the new environment. Ensure that you have all the necessary tools for installing hardwood floor, including a floor-nailer along with miter and jamb saws. Remove the old flooring, clean any loose material from the floor, make sure there are no nails sticking up and that the floor is flat. You may even want to put a sub floor down and / or nail down the existing sub floor to avoid any squeaks etc on your new floor. Many installers will use screw nails instead of nails to nail down the sub floor. They feel there is less chance for the floor to move. Begin the project by covering the clean, level sub-floor with a layer of asphalt felt and overlap the edges by a few inches. Fix the felt down with a staple gun, keeping the surface as smooth as you can. Then make measurements at various points in the room to draw a chalk center line parallel to the starting wall. It is also helpful to mark the position of floor joists on the felt as well. 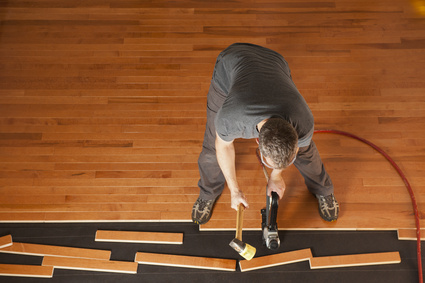 Another line should be marked out about ½ inch from the starting wall to set the edge of the first row of flooring. Actually installing hardwood floor now begins at the starting wall with the widest planks or longest boards. Drill pilot holes for 1 ½ inch finishing nails where the nail-heads will be covered and face-nail the first row into the floor joists and recess the nails with a nail set. For the next 3 rows drill pilot holes at 45 degree angles in the tongues at 10 inch intervals and at the joists and ends. Again fasten with finishing nails and set them with the nail set after ensuring the board is tight against the previous row. 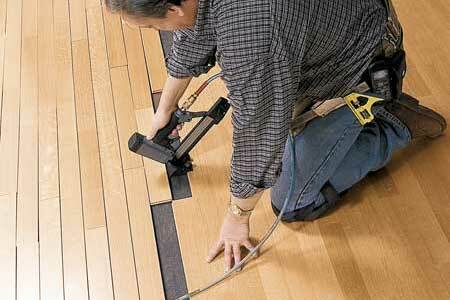 For the remaining rows you can use the floor nailer while being careful not to damage the floor. The final row should be wedged tightly into place while drilling pilot holes at the edge where the nails will be covered and set the nails below the surface.Installing hardwood floor in your new and improved room is now complete. The last step is to install the corner round around the edges of the room. This adds decor to the room, but also hides the gap you left at the edges for expansion. Apply some paint to the corner round and you are finished with your rooms new floor. You can now enjoy all the natural beauty and durability of hardwood. Hardwood flooring really does add beauty to any home. Along with this, the durable surface will last a lifetime and is a great investment. Installing a hardwood floor can take a little hard work. 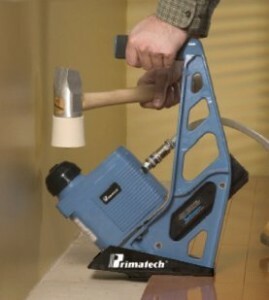 But with some planning and tools, like a hardwood floor nailers, the job can be much easier. Hardwood floor mailers are also dangerous. Make sure you follow all of the proper safety features when using them. The picture on the left is a typical hardwood floor nailer. There are many on the market. You should select one based on price and function. Take into account the amount of time you will use one. Sometimes renting a machine will be the less expensive option. Here is a little information about hardwood installation and the necessary tools to get the job done right. first we do want to point out that if you are uncomfortable with laying a floor and do not do well using tools or renovations, you probably should hire an expert. The job will be done well and it will be done quickly. Spouses tend to get a little frustrated if you take weeks or months to get the job done and even more so if it is not done well. Anyone who has worked with wood before knows that humidity and moisture cause expansion. For this reason, it is important to let your wood accustom to their new environment by storing them indoors for a few days. This will give you a little time to prepare the work area and make sure you have all the right tools. When you are installing hardwood over a large area, a hardwood floor nailer is essential to save time and effort. Ensuring a level, clean and dry sub-floor area is also a must. Mark the position of floor joists, the room centerline and a line marking the edge of the first boards along your starting wall on the vapor barrier you have laid down ahead of time. About 3/4 inch of expansion space should be left between the starting wall and the first row of boards. Wood will contract and expand. This expansion space will allow the floor to expand and you will not get buckling in your floor as a result. Then you are ready to begin. Most consumers who are doing this kind of work themselves will only need a hardwood nailer for a few days and you may need it only one time. It does not make sense to purchase one. There are many equipment rental locations that will rent out power hardwood nailers at an hourly or daily rate. Take advantage of this service and save yourself some money. There are manual nailers and powered nailers which drive the nails into the wood along the tongue and groove. Always rent a powered nailer. You will be exhausted after a few thousand nails other wise. The first row of boards is the most important row. If you have done your measuring and marking correctly your floor will be lined up properly with the walls etc. Take the time to measure several times to check your work. The first row of boards can be fixed into place by either using nails about 1 inch from the side of the starting wall or glued into place at six inch intervals. The glue used should allow for the natural expansion of the wood. This first row is also held into place with nails driven into the tongue at 45 degree angles by the nailer. Some people prefer to do this first row by hand but you can use the hardwood floor nailer if you prefer. Subsequent boards should be fixed into place and secured using the hardwood floor nailer. Always check for proper alignment along the way. Continue this until you reach the last few boards which should be secured by hand since the hardwood floor nailer will not be able to be used that close to a wall. After all this you will now be able to enjoy your beautiful new hardwood flooring.